Ryan Kern (44) of Marysville runs for a 53-yard touchdown against Olentangy Liberty on Friday. Also pictured is Jagger Snyder (88). Kern rushed for 111 yards during MHS’ 23-14 loss to the Patriots. The fortunes of a football game can turn when ball meets foot. 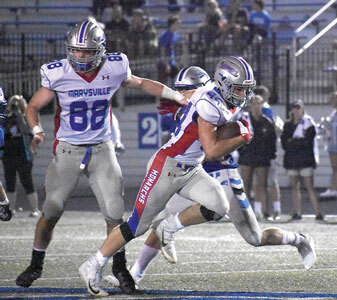 The pitfalls and positives of the kicking game were on display Friday night during a wind-blown game at Olentangy Liberty as the Patriots held off the Marysville Monarchs, 23-14. For starters, MHS was without regular kicker Thomas Wolfe, who reportedly sustained a head injury Thursday night in Marysville’s soccer game. This left two-way starter Bodie Eberhart to handle the kicking duties, which he did flawlessly on PATs. However, he lacked distance on kickoffs. MHS coach Brent Johnson said Eberhart was not caught unprepared as he practices kicking each week in practice. His initial offering set up the Patriots’ first score when Aiden Kenley returned the ball 52 yards to the MHS 25. In the second quarter, Liberty’s kicking game left a crack in the door with a missed extra point. That eventually allowed the Monarchs to claim a 14-13 lead in the third quarter when Eberhart hit his second PAT. The Monarchs appeared ready to pounce at another point in the third quarter when Liberty was pinned back in the shadow of its own goal post on fourth down. Taylor Bower, the Patriots’ rugby-style punter, jogged right and drove a low boot with the wind behind him. Not only did the ball stay in-bounds, but it caught a miraculous roll, stopping 70 yards down field at the MHS 12. Marysville’s lead would be short-lived, as Patriot kicker Ryan Bird redeemed himself, making good on a 26-yard field goal into the wind. The kicking game also closed the door on the game as Marysville tried to convert on a fake punt with les than four minutes left in the game. The try attempt appeared stuffed well before the firs- down marker and Eberhart fumbled on the play. That gave the Patriots a short field, which they used to turn a two-point game into a nine-point lead. For the third game of the season, the Monarchs won out in the stat book. Marysville held an edge in total yards 268-233 and converted 11 first downs, compared to nine for Liberty. The MHS offense saw some fresh faces get action in the backfield as sophomore Ryan Kern paced the Monarchs with 111 yards on 12 carries, including a 53-yard scoring run. Junior Colby Goodwin also saw some carries during Marysville’s first scoring drive, picking up a TD on a two-yard run. Johnson praised the physicality of his defense, which surrendered just 78 yards on the ground. After the long opening kickofff return, Marysville was playing catch-up almost immediately. Less than a minute into the game, Kenley took the ball in from a yard out and Bird hit the extra point for a 7-0 Patriot advantage. From there, first downs were hard to come by, as the teams traded possession eight times before the second quarter. Marysville got its offense uncorked on its second possession of the second frame. Eberhart and quarterback Walker Heard ran for a pair of first downs that moved the ball to midfield. The pair then connected through the air to again move the chains. The MHS senior signal-caller picked up another first down around the right end before Goodwin surged up the middle for 12 yards and putting the ball at the 7. Three plays later, Goodwin went into the end zone and Eberhart’s extra point tied the game at 7-7 with 4:12 left until the half. Just as the Monarchs had seized momentum, the MHS defense allowed its only drive of the night. “I would love to get back that series before the half,” Johnson said. The major damage was done on a 35-yard hookup from Mitchell Okuley to Kenley that put the ball at the three. Dylan Stevens got the touchdown from two yards out, but Bird clanged the PAT off the upright to put the Patriots up 13-7 heading into the half. Aside from Parrish’s clutch punt, the first portion of the third quarter was uneventful until Liberty tried to convert on fourth-and-10 at the Monarch 29. A screen pass was broken up, giving the Monarchs the ball and a surge of energy with 4:46 left in the stanza. Kern did the heavy lifting in the series, using some hard-nosed running to convert a long third down and then breaking free on another third down play for the long touchdown run. Eberhart’s extra point gave the Monarchs a 14-13 lead with 2:22 left in the third quarter. Once again, the MHS score served to awaken the Patriot offense. Liberty drove deep into Monarch territory as the third quarter ended and faced fourth down on the first play of the final period. Bird hit the 26-yard field goal to put the Patriots up 16-14. The teams traded three punts before Marysville’s failed fake kick, which gave Liberty the ball at the Monarch 38 with 3:41 left in the game. The Patriots made short work of the short field, as Okuley found Kyle Wilson on a third-and-10 situation. Wilson had to fight to get to the chains. Once he was there, he had nothing but green in front of him as he raced 39 yards for the touchdown. Bird closed out the scoring with the point after at the 2:44 mark. “If we can fix these little details, the chips will start falling our way,” Johnson said. The 1-2 Monarchs will host Grove City one Friday.